An exhibit of art photographs of Vancouver’s transit system opens for two days (Oct 15/16) at the Eastwood Onley Gallery at 2075 Alberta St. (at West 5th Ave., 2 blocks east of the Canada Line Olympic Village Stn), Vancouver. Hours are from 12:00 to 17:00. The artist, Andrew Firestone, studied the transit system and its vehicles extensively before creating his works. CC&F Brill trolley coaches are well-represented in the exhibition. Unfortunately, the exhibition was a disappointment to this writer. The gallery is small and only a fraction of the on-line works were displayed. However, the works themselves are attractive and colourful. The artist has successfully combined small transit elements – logos, tokens, signs – with exterior and interior photographs of transit vehicles. The resulting montages are well-balanced and pleasing to the eye. The exhibit is worth a visit if you are in the neighbourhood. I have been using OpenStreetMap recently a lot. Similar to other web maps such as Google Maps, Bing Maps, Yahoo Maps, and others, there are key differences. For one OpenStreetMap (OSM) is editable by anyone, all it takes is a user name and password to start editing. It has been described as the Wikipedia of maps. It is also possible to fix mistakes in the map right away, while the big online maps are updated a lot less frequently. OSM has a lot more bike paths, pedestrian paths, bus stops, train stations that the big guys don’t have. An advantage to non-profits like Transport Action, is that OSM maps can be published, copied and printed without restriction. 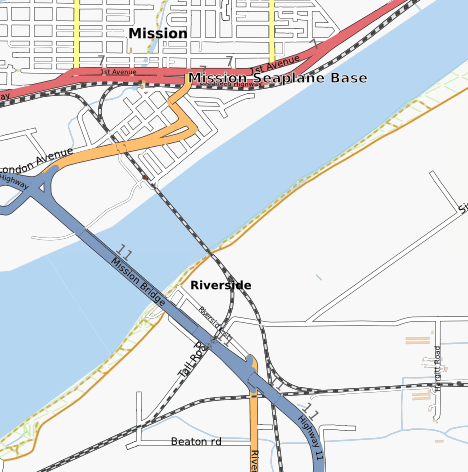 Figure 1 shows the West Coast Express station in Mission and the two VIA Rail stops in the vicinity, which I suspect aren’t widely known about. The Abbotsford stop (it can’t be called a station since it is just a platform) serves trains bound for Vancouver only, the Mission Harbour stop serves eastbound trains only. Figure 2 is the same area, same data rendered in a different manner. Note that this image doesn’t have the names of the train stops and stations. Other renderers exist for specialised uses such as the Cyclemap renderer that highlights cycling paths. A whole list of renderers is discussed on the OSM Wiki page. Figure 3. 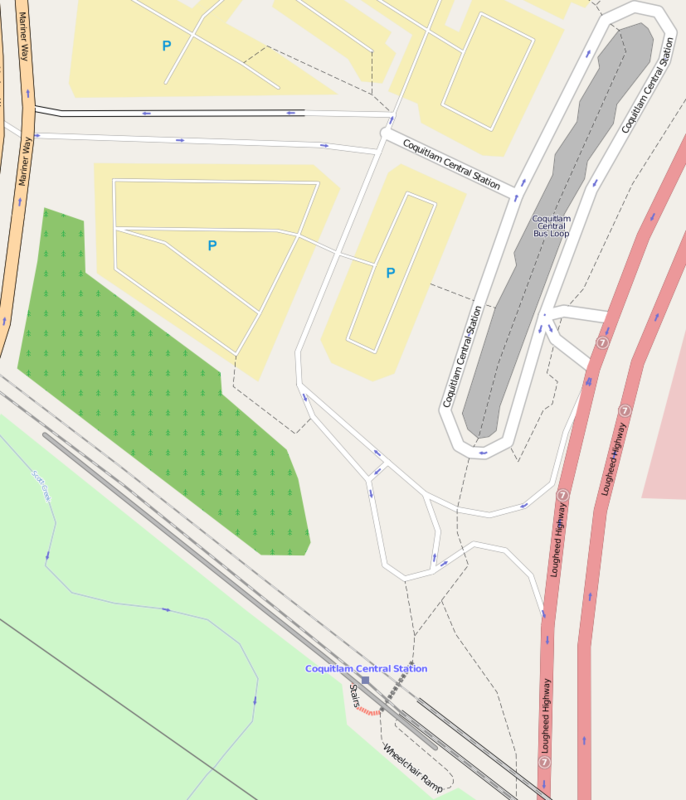 OpenStreetMap image of the Coquitlam Central Station area. Figure 3 shows the level of detail that is present in some areas. Details include the tunnel under the tracks, the wheelchair ramp, and the various paths to the bus loop and parking lots. 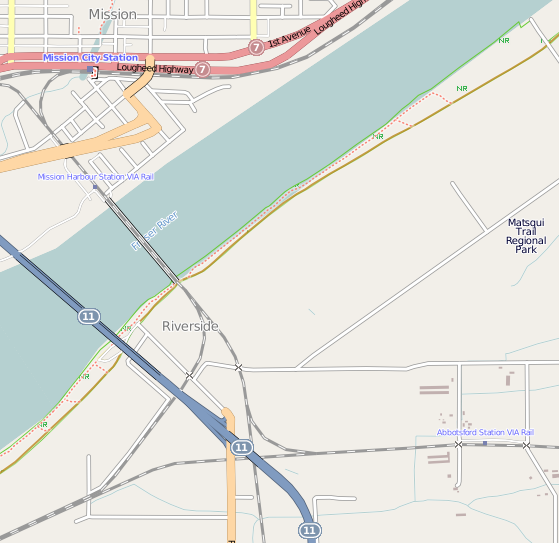 The database for OpenStreetMap is useful in routing software like GPS navigation, but has details for trails that other online maps don’t have. Expect to see many more maps created in OpenStreetMap on these pages in the future. Ken Liddell was a newspaper reporter who worked for several newspapers in the Prairie provinces. This book is a collection of 33 short stories about railroads, their workers, their customers and their role in Canadians’ lives from the late 19th to the mid-20th centuries. 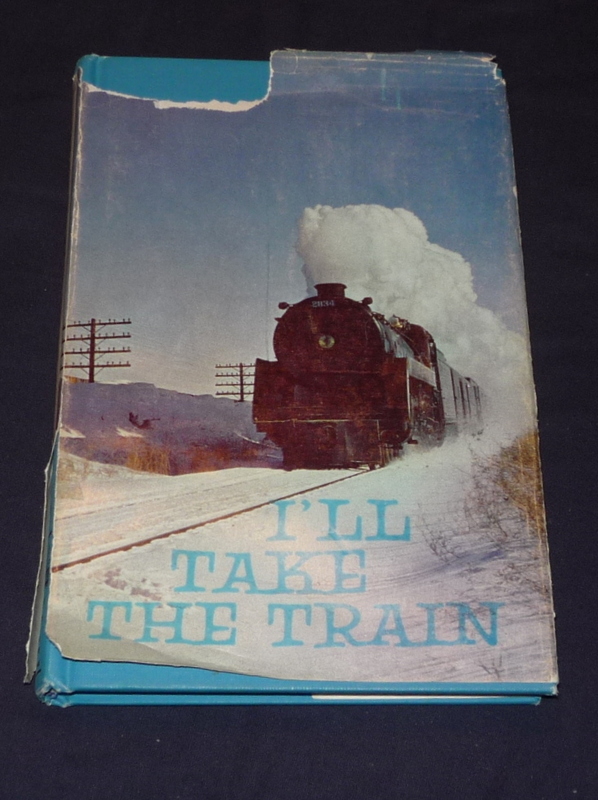 The stories are based on Liddell’s personal experience – he started his career as a teen-aged news agent working a two car, passenger local out of Regina – and tales, gossip, anecdotes and railroad folklore gathered on his many trips as a roving reporter for The Calgary Herald. The stories are humorous – “The Runaway Caboose” tells of an uncoupled caboose rolling back and forth across a road-rail bridge on a cold winter’s day in Peace River; sombre -“The Funeral Train” is about 21 RCAF pilots final trip in the baggage car after they are killed in a plane crash as they returned home from their last war-time flights; historical -“Radio Rides the Rails” details Sir Henry Thornton’s efforts to bring radio to the CNR, forming the basis of the CBC; and poignant – “The Last Run” describes the last runs of retiring steam locomotive engineers, one of whom helped build the road he ran over on his last trip, 41 years later. Liddell writes with a light, but descriptive and evocative, style. In “The Boat Train”, the Minto, a CPR stern-wheeler, working south on the Arrow Lakes is described as “hustl[ing] her bustle down the lake like a fussy old lady with a tall white feather in her hat.” The above mentioned runaway caboose “incident would have drifted into the passing track of memories” except for some innocent questions raised at a business dinner. British Columbia’s PGE passenger service – pre-RDC – is delightfully described in “The Pacific Great Eastern”. How can one not relish Liddell’s picture of a porter in his moccasin slippers waking passengers to view the Fraser Canyon or the dining car steward valiantly trying to serve passengers iced tea with only two tall glasses assigned to his car? This book was a pleasure to read. As one who came of age well after steam locomotives and mixed trains to everywhere, Liddell’s stories provide a view, possibly rose-coloured, into a different era of railroading and life. In many instances, the railroad side of the story is incidental to the human interest side but this only serves to emphasise how deeply embedded into Canadians’ lives the railroads once were. This book will interest rail fans, armchair historians or those simply looking for a good chuckle over people’s foibles. Unfortunately, the book is long out-of-print so those interested in reading it will have to check local libraries or thrift stores to locate a copy.